Hi everyone, Here's my modification of 8416, fully motorized and remote controlled. An additional function is the working & tilting steering wheel. The PF elements used are: - 1 M-motor for driving - 1 Servo motor for steering - 1 M-motor for lifting - 1 M-motor for tilting the lifting assembly. - 2 IR receivers - 1 Rechargeable battery box Rebrickable: http://rebrickable.com/mocs/Chilekesh/8416-fork-lift-motorized-rc Bricksafe: http://bricksafe.com/pages/Chilekesh/8416-motorized (*.lxf file can be downloaded here). Any suggestions on improvements are very welcome. Happy building! Hello to everyone. I'd like to present a new project. I'm building an Underground Mining Loader. The idea came to me two years ago when Lego released the set Mine Loader (42049). By the time, I was expecting this to be the flagship model (1H) of that year, but it turned out to be a medium-size model. So I built my own. I took parts mainly from my Volvo Loader (42030) and built a version with a much lower profile. The result was ugly but functional. It's being on a corner getting dust. A couple of weeks ago I took this Moc apart and I'm rebuilding it from scratch. I'm not showing the "original" because it's really ugly. I hope I can make a decent model, something between good-looking and functional. Although most of the ideas come from the previous Moc, the "improved version" it's proving to be a difficult job. I think it would take a couple of weeks to finish the improved version. Here're some pictures from the first part. I'm happy with the results. I think 1/5 of the job is done. Disclaimer: I'm not trying to replicate a specific machine, but I have taken inspiration from the Caterpillar portfolio Thank you for your time. ****Pictures of the final model**** Lateral access to motor. For maintenance purposes, I guess. Hardly noticeable IR receivers ;) Easy access to motor. Cabin with chair and control panel. No floor. Easy access to battery and cables. You can also accommodate the rechargeable battery. The origins of the idea: The core of this model consists of three rings which can independently rotate around three perpendicular axes. These pivoted rings are called gimbals. Gimbals have been used in a wide variety of engineering applications since ancient times till modern days. Gimbal suspension is used to provide stability to objects inside unstable environment, e.g. compasses on ships and gyroscopes on planes. Furthermore, the simplicity and effectiveness of gimbals often attracted artists' attention. In science fiction and fantasy, gimbals have been used to represent complex contraptions capable of creating new physical effects and even manipulating the very fabric of reality. Some of the examples include the machine from the 1997 movie Contact, the gravity drive from the movie Event Horizon, mass relays from the video game series Mass Effect and even the Time-Turner from the movie Harry Potter and the Prisoner of Azkaban. LEGO implementation: The idea of this model is to set gimbals in motion. Complex transmission allows each of the three motors to independently operate one of the three rings. Therefore the contraption is very easy to control. The rings and the frame are perfectly rigid and secure. The design of the model is intentionally minimalistic so that it could be used as a part of larger models. Video demonstration: Simple version: There is also a simplified version of the model with only two rotating rings and one motor. It may be also actuated by hand. 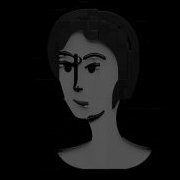 Video demonstration and speed test of this version: Afterword: If you like this idea, please support my project on LEGO Ideas and share it with your friends! Thank you for your attention! Hello This is my first post here. I got 7715 from my childhood and just recently by a luck I got complete 810 motorizatioon set which can be used with 7715, according to instruction sheet. However I have no idea how to put battery box from 810. It's almost 7 studs wide (6 studs plus half a stud on every side - battery box thicker cover. I think I must build additinal train car from this battery box but grey is not so good looking. Have you ever tried using this approach? HI, This is AT-TE With Motorized & Lights,hope you like. Hello everyone. This is my very first motorized lego vehicle. I'm wondering if somebody could help me to improve all the mechanisms. The vehicle has front steering (this technique requires less space between wheels and mudguards). It's powered by two motors (PF L and PF Servo). I would like to know if there is a way to implement a differential gear. I'm also looking for the best steering technique. I would appreciate any ideas. This is my model of the Meter Maid Cart from Zootopia. Features: Full independent suspension; Easy access to battery box. Remotely controlled Power Functions: Driving (Large motor); Steering (Servo motor) + synchronized steering wheel; 4-speed sequential gearbox (just for fun!) switched with a Servo motor. Windscreen wiper (Medium motor). Manually controlled Power Functions: Headlights (manual switch). Manual functions: Rotating flash lights. If you like this model, please support it on LEGO Ideas! Also, if you like Zootopia, see my models of Judy Hopps and Nick Wilde! Or even support them on LEGO Ideas! I finally have good pictures of the demonstrator model for my take on a cheap no-modification-required switch track motor. Have a look! The key that makes this work is that the servo acts on a slider, which pushes on the little spring-loaded switch point piece, rather than forcing the lever mechanism back and forth. As such, it takes very little force to change the switch from open to closed and vice versa. I'm using two of the 1x1x1 corner panels to trap the servo horn so that it pushes the slider back and forth, while a 2x2 corner tile pushes the point piece backwards and forwards. The actual switch lever needs to be in the 'open' position to allow the point piece to move back and forth properly; otherwise, the switch will stay closed even when the servo releases the point piece. I'm using an Arduino Uno, but you could use any Arduino or compatible clone as long as you get the pins hooked up right. It's a lucky coincidence that the servo is the size it is; two of the 1x2x3 panels form a nice enclosure that keeps it from moving about too much. It's important to get the older style that don't have the reinforcing ridges on the edges, as otherwise it won't fit. I used a small piece of paper folded on itself a couple of times to keep the servo wedged in tightly. I imagine you could use some of those 1x2 bricks with the vertical groove in them to help hide the servo cabling, but I didn't bother since this is only a demonstrator. Here's a better view of the setup without the track in the way. My servos came with a pack of three differently-shaped horns to put on them - I'm using the shortest one available to me (mine was 19.5mm long with six small holes in it and was the only one with one 'arm' on it). I also have not permanently attached it with the screws that also came in the package, mainly for the purposes of testing. Lastly, here's a picture of the support structure I built up to keep everything in place. I also made an LDD file of the structure as well as the slider mechanism and servo holder so that you can build your own! http://bricksafe.com/files/Phoxtane/digital-model-files/servoswitchtrack.lxf The hard part of this built is not the mechanism, but setting up the servo as well as the Arduino controller. If anyone is interested, I can do a more in-depth post on how these servos work and how to use them, but the basics go something like this: Attach the servo to the Arduino using the diagram on this page: https://www.arduino.cc/en/Tutorial/Sweep Test your servo to make sure it's working using the example code on that page (the servo should slowly move back and forth between its endpoints) Center the servo at 90 degrees - http://www.allbot.eu/build/allbot-arduino/centering-a-servo/ - this puts the servo at a known position for use in our mechanism Place the small one-arm servo horn onto the servo spline so that it's pointing across the servo body, not away from it. This allows the servo to reach the little pocket we've built and actuate the slider. This is the tricky part; you have to play around with the Arduino code to calibrate your servo for its switch track. These servos are mass-produced as cheaply as possible, so the actual physical position of the horn at the 0 and 180 degree endpoints will vary somewhat from unit to unit. For my servo, the two positions the servo should move to for a closed and an open switch are about 83 degrees and 113 degrees, respectively. The corner tile should barely touch the point piece when open, and should keep the point piece tight against the outside track piece without the servo struggling or forcing itself out of position. I made some minor improvements to this code for my demonstrator - the servo doesn't sweep between positions, but jumps between them, so it's faster to actuate. I also have the Arduino disconnecting the servo in between movements so it doesn't 'hum' while waiting to move to the next position. General improvements to this model would include building the mechanism out of DBG and black for the servo holder, as well as tidying up the wiring to the servo. The servo horns stand out quite a bit color-wise, but since they're nylon, they could easily be dyed black to match the servo housing, and the silver-colored screws that come with the servo horns could be touched up with some paint or nail polish to turn them black as well. The only downside to this mechanism is that you can't run a train backwards through the straight part of the switch when it's closed, since the point piece can't move out of the way. Since this is already being controlled by a microcontroller, it wouldn't be difficult at all to add some sort of sensor that would open the switch when a train is approaching it from the wrong side. As for overall cost, beyond the price for the pieces needed to build this barebones mechanism (I had all of the pieces in my collection): I bought a ten-pack of these servos for $2 apiece, and if you don't already have one, a small Arduino starter kit can be found online for $25. The Arduino Uno has six analog pins, so it can potentially control up to six servos at once. If you're starting out from scratch, the total cost for six motorized switches would end up being around $37 - which is much cheaper than the ~$125 it would take to build this out of genuine Lego parts (one battery box, six M-motors, three IR receivers, three IR remotes), and it doesn't take any PF channels. 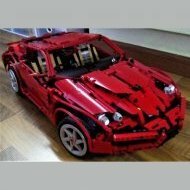 Inspired by Lego's Ferrari 599 and Enzo models, I've created something 'beefier' . Main characteristics: Measurements - 50 cm (L), 25 cm (W) and 15 cm (H). Weighs 2.5 kg. All wheel drive (AWD) with 3 open differentials. Full independent suspension. Steering - KPI, Caster, Progressive Camber, sharp steering up to 40 degrees. Towerpro MG995 Servo. Powered by a brushless 4370KV motor at 9 volts . For fun and laughter .